Is it seriously already time to elect a new president? Like, why do we start this process so early? You’re interrupting my Today Show, Marco & Hillary. Why do we announce that a candidate is ABOUT to announce they’re running? This is maddening to me. & why is the news revealing everyone’s campaign strategies? Isn’t that cheating? I literally know where Hillary will be every week for the next 8 months. This is dangerous! I wish I was a better citizen. I’d like to be jazzed about it all, I really do. Be one of those people with the bumper sticker & the yard sign. Maybe even a t-shirt, I just don’t know. I just don’t feel like I’ll connect with any of the candidates until we start digging a little deeper than foreign policy & the economy. Like, I want to know my president. Television show currently binge watching? Weird thing you do when you’re home alone? Do you fold or wad your toilet paper? Getting right down to the psyche. I’m hopeless, aren’t I? Topanga 2016, y’all. 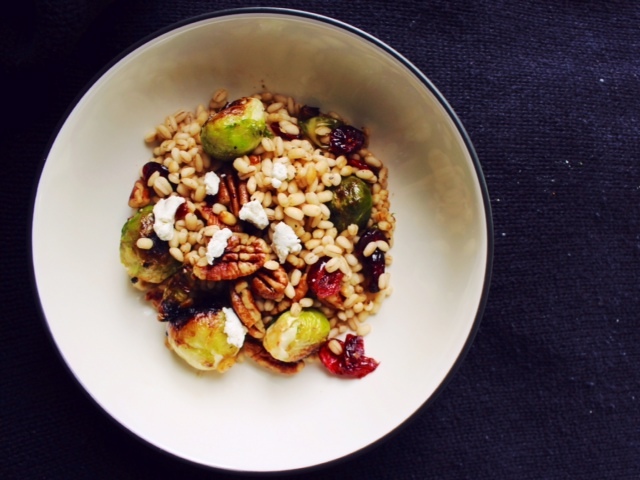 This totally reminds me of my favorite brussels sprout side dish – PLUS barley and goat cheese…definitely stealing this!! Oh my YUM! This looks DELISH! I’ll have to try this! I hope you do! Thanks for reading! Mmmm this looks great! 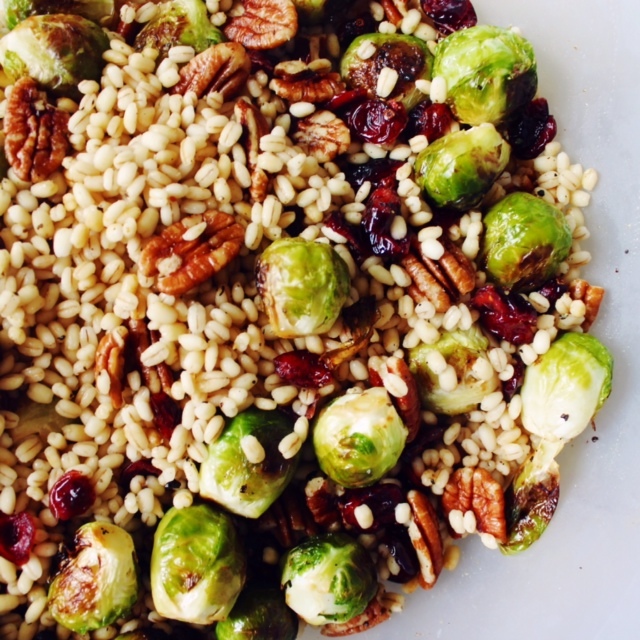 I like the idea of using brussel sprouts as the “meat” of a dish. I’m sure it’s just as filling as putting chicken or something in there. On another note though can you link your bloglovin page again? 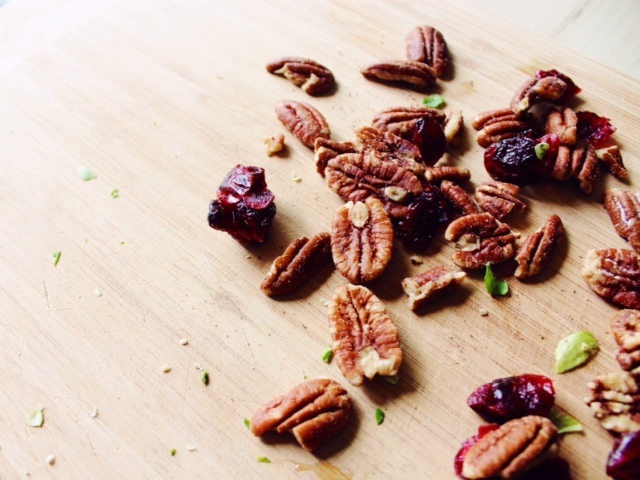 When I clicked it from your other post it took me to a photo instead of to bloglovin, weird! Me & the man were both plenty full! Though you could definitely add in some meat, too. This looks amazing! Have ALL the ingredients that I love! Side I am 100% with you on this. 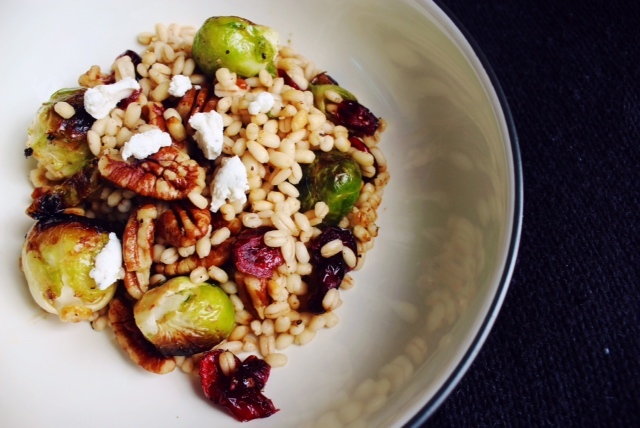 somehow i feel about brussel sprouts the same way you do about presidental candidates, but my kids love them (brussel sprouts, not politics); so i endure them 🙂 i’m voting goat cheese 2016! 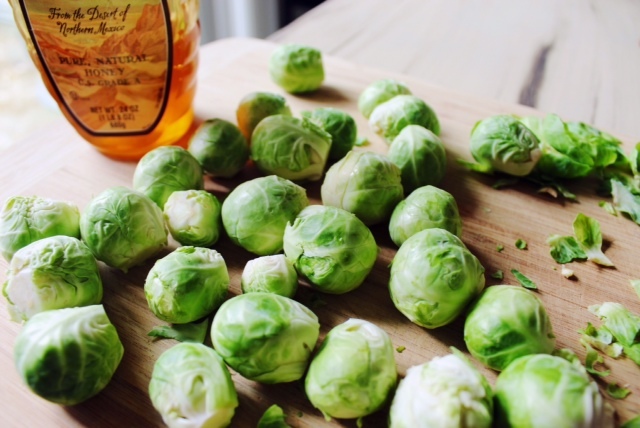 Your kids love sprouts & not you?! I’ve never heard of such a thing. But I’m TOTES with you – let’s write in goat cheese on the ballot…. omg, so here i am at work, clearly doing my job, wondering when and whether you will ever post again, only to find out that the reason i have not heard about what’s going through your brain/kitchen for the last few weeks is BECAUSE I SOMEHOW UNSUBSCRIBED. this is me, year 2015, confessing i am an internet neophyte. anyway, i am very excited to find out this is my fault, and not yours. please, please carry on. OMG I WAS WONDERING WHERE YOU WERE. Don’t ever leave me again, ok? That’s settled. Whew. Never, ever again. Apologies for ever doubting. Love your photos. And your stories!